Dallin Harris Oaks is a member of the Quorum of the Twelve Apostles for The Church of Jesus Christ of Latter-day Saints (often mistakenly called the Mormon Church). Elder Oaks learned about responsibility at a young age. When Elder Oaks was just eight years old, his father died and at the age of twelve, as the oldest child, he began working to help bring in much-needed income. As a teenager, he taught himself the skills needed to obtain a radio operator’s license and then earned the bus fare to go to the testing site. This hard work paid off. He was accepted into Brigham Young University, where he met and married June Dixon. He graduated with a degree in accounting and then graduated with honors from the Chicago University Law School. It was his father-in-law who suggested a law career. He had initially wandered through several possibilities, including radio and television, linguistics, and medicine. Elder Oaks’ career progressed rapidly. He served an internship as a clerk Chief Justice Earl Warren of the Supreme Court and then went into private practice in Chicago. He served as counsel to the Bill of Rights Committee of the Illinois Constitutional Convention. 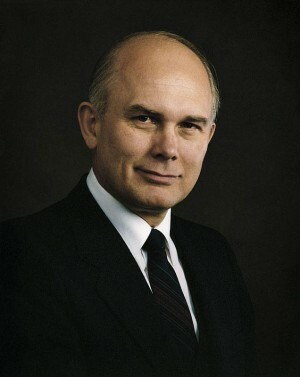 Dallin H. Oaks also served as a consultant to the Office of Economic Opportunity during Lyndon B. Johnson’s war on poverty. In 1961 he joined the faculty at the University of Chicago. He served in a variety of increasingly important positions in both his professional career and in his church service, and in 1970, he was chosen to be the president of Brigham Young University. During that time, he also served as president of the American Association of Presidents of Independent Colleges and Universities. During this time, he worked to fight against the increasing efforts of government to regulate private schools, although he stated that in general, he preferred to be for things, rather than against them. In 1981, he became a member of the Utah Supreme Court and by 1984 was being discussed as a leading contender for the United States Supreme Court. However, at that time he was called (chosen) by Spencer W. Kimball, then president of the Church, to be a member of the Quorum of the Twelve Apostles and let it be known he was no longer interested in government positions. He considered the Lord’s work to take precedence over government service. In his service as a church leader, Elder Oaks often tackles difficult topics without apology or hesitation. For instance, he and another church leader participated in an extensive interview on the subject of same-gender attraction. He recently spoke out on the subject of divorce, recognizing the sensitivity of the subject and speaking both to those who are divorced due to the sins of others, and to those contemplating divorce for less serious reasons. Elder Oaks is known to read as much to study the writer’s style as he is to learn the content, and this attention to writing skill shows in his talks and articles. One recent talk is often quoted by church members who are trying to prioritize busy lives. He pointed out that there were many good and worthy things to do with our time, but not all things were equally good at all times. He taught listeners to divide possibilities into “Good, Better, Best” and then make choices accordingly. The fact that he has accomplished an extraordinary amount in his lifetime, often holding several positions at once, shows he has personally mastered this concept.